SprintWork is an effective distraction blocking and time tracking software that can help you get work done on time and recover valuable time lost to social media and games. By default SprintWork blocks Facebook, Twitter, Youtube and other social networking websites using a fully customizable website blocking list that can be set in three modes: block list, allow list and complete blocking of all Internet access. 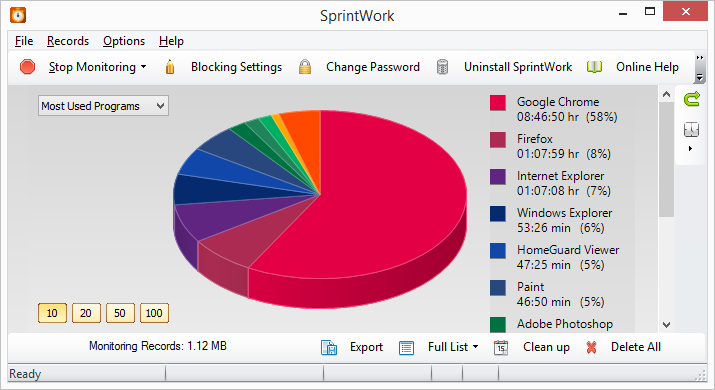 SprintWork is an effective distraction blocking and time tracking software that can help you get work done on time and recover valuable time lost to social media and games. By default SprintWork blocks Facebook, Twitter, Youtube and other social networking websites using a fully customizable website blocking list that can be set in three modes: block list, allow list and complete blocking of all Internet access. All three modes can be configured to take effect only on specific times of day or days of week with the option to lock settings changes for a certain period of time. In addition to online games SprintWork can also block or time restrict desktop games and programs and it tracks active time spent on each program, total run time, start and stop times and every Window title each program had while using it.